The ITM can be used to redirect `printf()` function calls. This allows a `printf()` style debugging capabilities on an embedded platform, which typically doesn't have a standard terminal window for output. The ITM is part of the Coresight debugging and trace system, shown in the right of the below diagram. 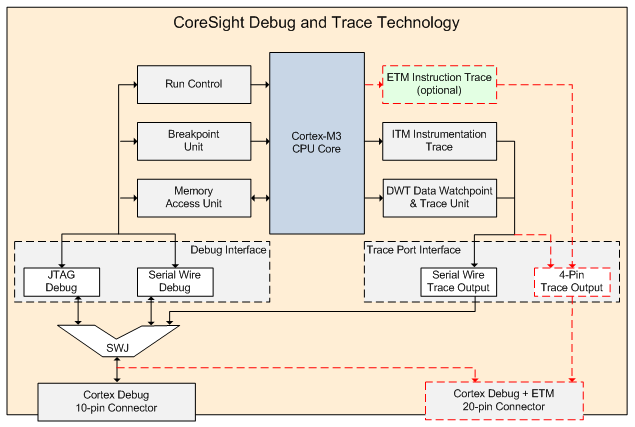 The ARM Cortex-M3 Coresight debug and trace overview diagram. Image from http://www.keil.com/support/man/docs/ulink2/ulink2_cs_core_sight.htm. printf() ultimately relies on the function fputc() to do the low-level character outputting. So this is the function we are going to replace. The following code shows the re-definition of fputc(). Note that the passed in file argument f is ignored altogether. ITM_SendChar() is a Cortex-M3 function provided by ARM and is defined in core_cm3.h. The declaration of it is shown below (for reference purposes).